Kizhi is a technique used in the management of various pain related conditions affecting the musculoskeletal and neuromuscular systems. 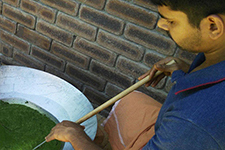 Kizhi is utilised in both Kalari Chikitsa and Ayurvedic treatments. It is often combined with massage to increase the pain relieving benefits. Kizhi means poultice in Malayalam (the language of Kerala in South India). In Sanskrit, it is known as Pinda Sweda. 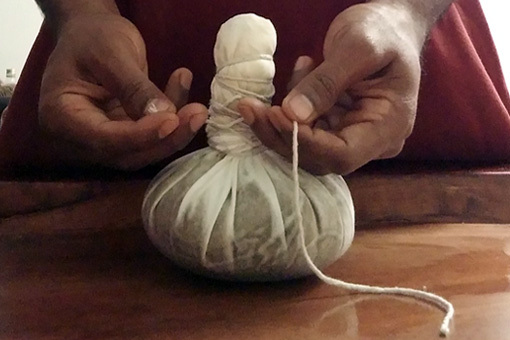 A Kizhi is a poultice that is densely packed with herbal ingredients and heated in warm herbal oil throughout the treatment. The Kizhi is massaged over the affected area or the whole body as required. The warmth of the poultices, combined with the active ingredients of the herbs and oils, improves circulation and reduces body stiffness and pain. The Kizhi ingredients, herbalised oils and massage techniques are all selected according to the type and cause of your pain. There are many varieties of Kizhi and the name is given based on the ingredients tied within the poultice. The kind of Kizhi used is chosen according to what is most suitable for your particular condition. 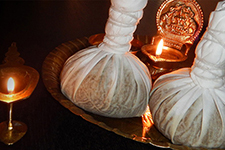 This Kizhi is a specialty of Kalari Chikitsa and is included in the Kalari Marma Massage. As Kalari Chikitsa was developed to prevent and treat warrior’s injuries, this Kizhi is useful in modern day sports injuries. The herbal ingredients in the Kizhi are made from secret recipes passed down through the generations from master to student. As with the herbal medicines and oils made in Kalari Chikitsa, each Kalari lineage has their own recipes. The main ingredient in this Kizhi is Navara rice which is harvested in 60 days and is used exclusively for treatments in Ayurveda. The rice is cooked in a mixture of cow’s milk and herbal decoctions and tied in a poultice. The poultice is dipped into warm milk and herbal decoctions throughout the treatment. The ingredients are rejuvenating and nourishing to the body. This Kizhi contains fresh leaves of medicinal plants that are fried with other herbal ingredients. The Kizhi is then dipped into warm herbalised oil and applied to the affected body parts. The main ingredient in this Kizhi is lime which is cut and fried in herbal oil with herbal powders. The Kizhi is then dipped into warm herbalised oil and applied to the affected areas of the body. Unlike the other Kizhi varieties, this one can be applied with or without oil. The Kizhi contains herbs that have been dried and then pounded with a mortar and pestle into a fine powder. The Kizhi can be warmed in medicated oil throughout the massage, or can be applied without oil when a dry heat is required.